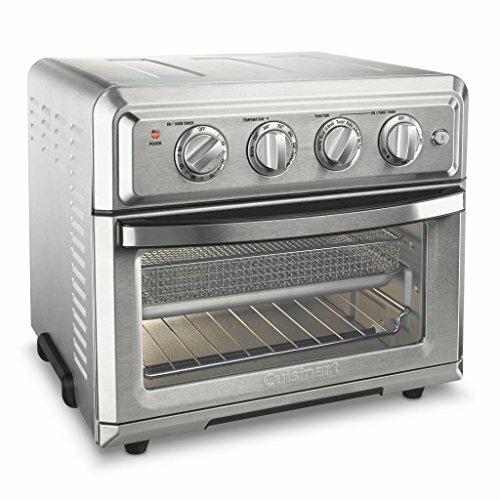 Cuisinart TOA-60 Air Fryer Toaster Oven with Light, Silver by Cuisinart at Three Guys Pies. MPN: TOA-60. Hurry! Limited time offer. Offer valid only while supplies last. The Cuisinart AirFryer Toaster Oven is a premium full-size toaster oven with a built-in airfryer. It will not only bake a 4 lb. chicken or 12 in. The Cuisinart AirFryer Toaster Oven is a premium full-size toaster oven with a built-in airfryer. It will not only bake a 4 lb. chicken or 12 in. pizza, broil salmon steaks, and toast 6 bagel halves at once, it can also airfry up to 3 lbs. of food using little or no oil. Powerful ultra-hot air “fries” favorites like wings, chicken tenders, and fish and chips to crisp, golden-brown doneness. And since a toaster oven stays on the countertop, this is a fryer that never has to be put away. Enjoy the crunchy texture and tastes you love – no deep fryer required. The AirFryer Toaster Oven, only from Cuisinart!